I arrived to the Austrian Space Forum on Thursday afternoon. The Spacesuit team gave me a warm welcome, and gave me an update about the preparation for Rio Tinto Dress Rehearsal. The Lander Mock-up and the rover were not here yet; they were expecting them to arrive the next day. 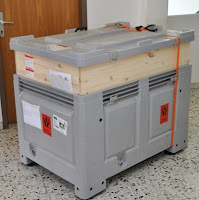 There was a good and a bad new: the omnidirectional camera was here already, but unfortunately the glass tube was broken during its way from Canada to Innsbruck. The surface of the mirror had some scratches because of the glass pieces so it was polished. We needed to improvise using plastic sheet to replace the broken glass. Martin Seebacher was really helpful to have this solution ready by the end of the night. Glue and tape was used to fix the plastic sheet into the tube rings. We worked our best to minimize the visibility of glue lines or tape on the pictures taken after this implementation. Some tests were done with the camera to fix the field of view of the lens. Pictures of the broken glass were sent to John Walker in order to ask for insurance. The Lander mock-up arrived during the morning and the first thing I noticed was that only one orange belt was around the gray container. The belt was damaged, what it means that there were some issues during the transportation. I verified that all the pieces were inside the box, and took them to the roof to proceed with the Lander Mock-up assembly. The roof will be the simulated Moon/Mars field. During the afternoon, we had a general meeting with all the teams involved in Rio Tinto Expedition. Gernot Groemer explained us the different experiments involved in the mission, and he gave us general announcements which are basically explained in the ‘Mission Manifest’ V1.2 (23Feb2011). Spacesuit tests started during late afternoon, and I started to test our video application with the omnidirectional camera. 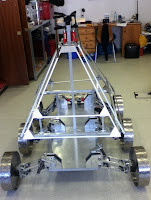 The rover arrived, and it was necessary to figure out a way to mount the camera on the rover mast. 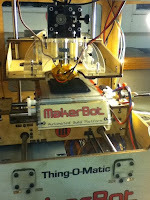 With the help of Martin Seebacher, a simple rapid prototype holder was designed and printed late night. The camera holder was placed on top of the rover mast. This holder was made of two different plastic pieces, which ones we fix together with glue/gel. We will use the Philleas Rover to test the omnidirectional camera, but unfortunately the rover today presented different problems related with the wheels, and the electronics. People in charge of the rover worked the entire day trying to fix the problems, and at the end the rover was able to move straight, back and forth. A problem with the motor is still present, so hopefully this will be solve by tomorrow morning before the robotic tests. 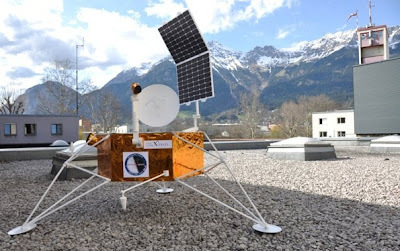 The application to take pictures and video with the omnidirectional camera was ready, and a request about using a different OS or an extra laptop on board the rover was made. Today, the spacesuit test included a simulation where the astronaut took a ‘contamination sample’ from the Lander. Two complete simulations were done during the day, improving all the logistic process for the second time. Good lessons learned from today, and for sure this will help to have a successful mission in Rio Tinto. The camera was finally mounted on the rover mast. The camera will be powered by USB, using an extension if necessary. We will wait until the end of the day to see if the problems with the rover’s motor are solved. The EVA today includes our Lander. 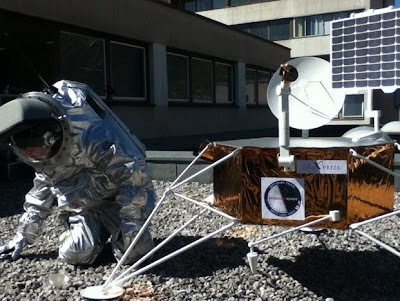 Three small pieces of paper with numbers were placed - without using any tape just the paper - in different parts of the Lander. The suit tester will need to search for the papers while simulating an inspection of the Lander for possible damages.